You have to start by exporting your file from Motion 4 in the correct format. When you go to File and Export you will then choose to match the quality settings that you started with and do it as a QuickTime file. You will let the export occur and then close out Motion 4 to check the QuickTime file that you produced to make sure that it is identical in quality and content to what you just created. followed by the DVD folder. Choose DVD Best Quality 90 Minutes if you are looking to get the best possible quality, otherwise you can select another option. Drag and drop this folder into the same location as you dropped the QuickTime file. Now you will have a video file and audio file that will be compressed. Select both of these in that pane and go to Target, Destination, and choose where you would like them to go. Now you can submit it and the compression of the Motion 4 file will begin. Once Compressor 3.5 has finished the compression process you will open up DVD Studio Pro so you can author your DVD and choose the Basic mode. You will then import both of those files into your DVD Studio Pro assets. Go into the Graphical view and select Track 1. You will now want to name the track and set the End Jump point to Menu 1. Drag and drop the two files from assets into the track and begin setting chapter points where you want them. Go into Menu 1, give it a new name, and create a menu format or use a template. Set buttons to play and make sure that the track is properly linked at all levels. 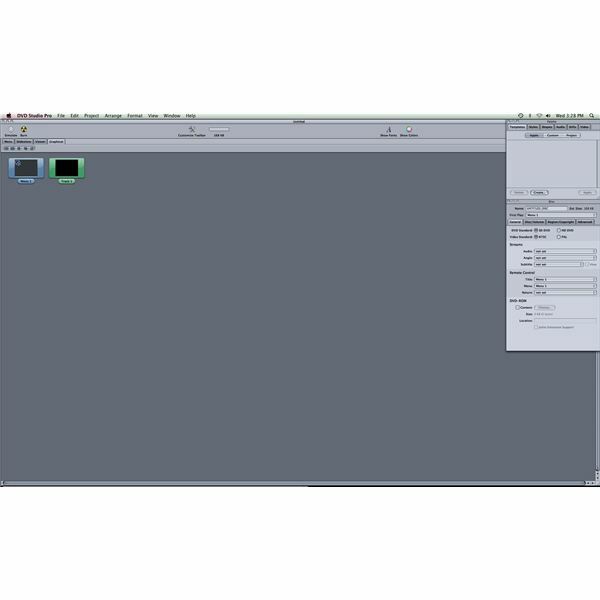 Go to Simulate to test out the DVD and make sure that your DVD Studio Pro project is playing like a correct DVD. From here hit the Burn button and the burn process will begin as long as you have a proper DVD already in your burner. Once it has completed you will have a fully authored DVD with your Motion 4 project on it playing like a regular video file.